by Randle White P.E., Division Engineer, Field Division 8, Oklahoma DOT; Jason Langhammer P.E., Senior Project Manager, Garver. 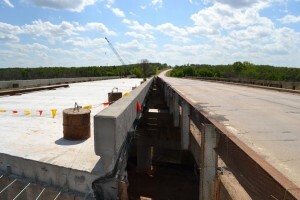 Description: In 2014, the Oklahoma Department of Transportation completed its first fully accelerated bridge construction project on SH-51 over Cottonwood Creek. 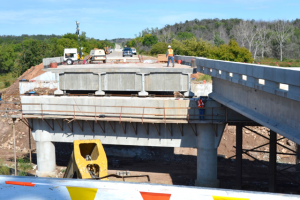 The old six-span 270-ft-long structurally deficient bridge over Cottonwood Creek was replaced with a widened three-span 260-ft-long prestressed concrete bulb-tee girder bridge. Multiple ABC methods were evaluated, and due to the site requirements, a transverse slide method was chosen. 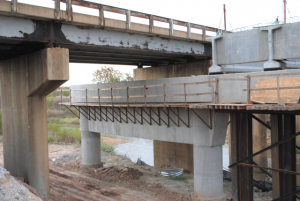 The new substructures were constructed underneath the existing bridge and temporary supports were constructed while the existing bridge remained in service. During the slide, SH-51 was closed and a 30-mile detour was required. 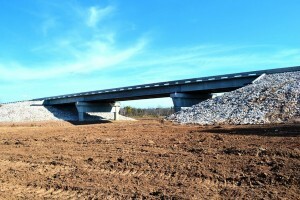 The bridge was closed for 10 days of the 21 days allowed in the contract. This presentation will describe the planning, design, and construction details for this successful ABC project.